A private plane carrying 16 people — including the rap star Post Malone — blew 2 tires during takeoff this morning from Teterboro Airport in New Jersey, en route to London. The pilot has been burning fuel for hours before attempting an emergency landing. The original plan was for Massachusetts; now it’s being diverted to Stewart International Airport in New York. 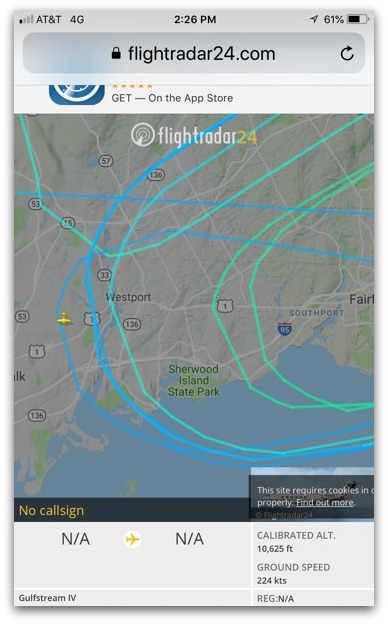 According to a screenshot sent by Bart Shuldman, the plane has been making loops around the tristate area — including many passes over Westport. The flight is still in the air. Click here for the radar link. This entry was posted in Totally random and tagged Post Malone, Teterboro Airport. Bookmark the permalink. This is newsworthy? Com’n Dan! Flight landed safely. It is speculated that it couldn’t continue to London since couldn’t retract landing gear so not enough fuel with increased drag. I’m sure interviews with pilots will clear it all up for you. I heard they wanted to land at Compo but Post Malone couldn’t afford the beach pass. Nice! You win the Internet today!